I slept very well and woke up early but it was still raining, so of course I went back to sleep. No one ever leaves a shelter early when it’s raining so everyone was slow to move. We had heard there’d be tubing down the river in the morning as part of the hiker feed but figured it was off because of the weather and did not rush to get there. Eventually the rain slowed and we hit the trail. 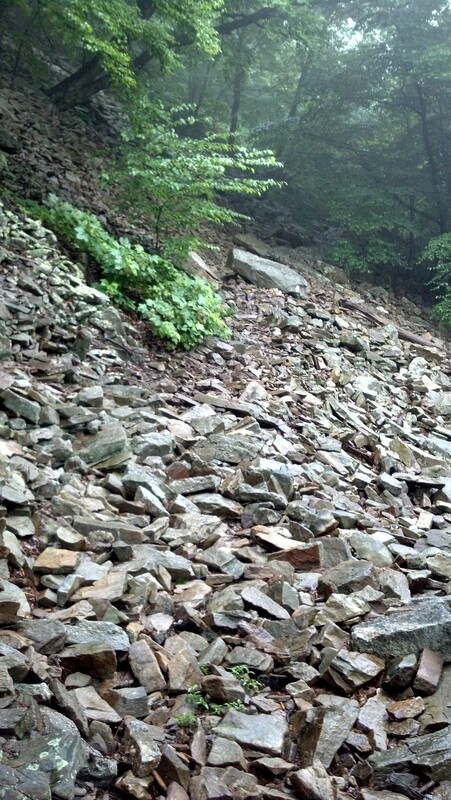 We did find a rocky part of PA this morning, and it was extra slow moving because the rocks were wet. The mosquitoes were out in full force as I moved down the hill towards town. When I got to the road into Duncannon after 4 miles, I found several hikers standing around in the bushes, which seemed strange until I realized there were tons of raspberries. I started grazing with them, and then filled a water bottle with more berries to eat later. I probably got a ton more bug bites standing there but it was worth it. So delicious. 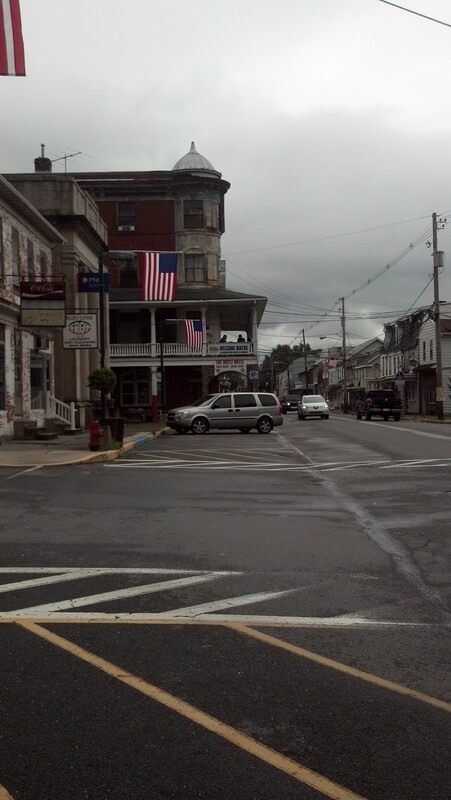 We stopped at The Doyle Hotel in town, a place that is very welcoming to hikers. Stretch and Naga and I decided to split a room there instead of camping at the hiker feed so we’d actually be able to get some sleep without party noise. It’s cheap because it’s rundown. The bedrooms are fine but the shared bathrooms are in terrible shape. I’ve heard many stories about how bad the Doyle is and wanted to check it out for myself. We hung out at the bar for lunch and a while after, then headed down to the campground for dinner at the hiker feed. Trailangelmary puts a lot of work into this weekend and is helped out by Billville, a group of hikers from 2000 and their friends. I had met Jester, the mayor of Billville, doing trail magic yesterday, and he gave us a ride to the campground. The dinner was great and there was plenty of food for all the hikers there, including lots of baked goods made by Jester’s mom. After dinner a few of us grabbed tubes and went floating down the Susquehanna River. It was very relaxing, and dark by the time we finished. We ended up by the Doyle, so I ran in to change into dry clothes before getting picked up to go back to the campground. Jester was showing a film he made about his CDT hike when we got there. I definitely want to do the PCT and CDT after talking to so many people who’ve done them on this trip. After the film we got a ride back to the hotel for bed. Good day.